Welcome With the publication of our 11th edition of The Red Book, we challenged ourselves to provide more value to you the reader. 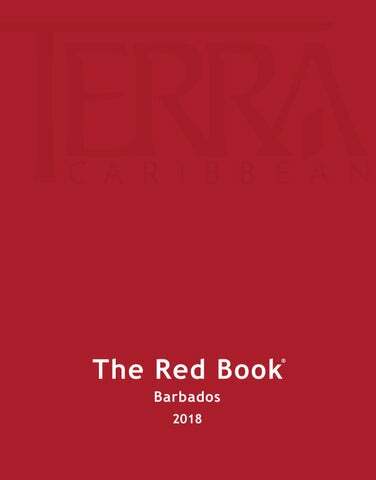 For the very first edition of The Red Book, our concept was to produce a reference for the Barbados property market. It was never meant to be a sales listing guide of what we had to offer, but rather a reference point for the industry to gauge the market. To this end we gathered as much info as we could, we verified it as best we could, and then we tabulated it and published it in a way that was easy to understand. We learnt much in this process and we developed our knowledge culture around this annual publication. Knowledge is a very interesting resource - unlike other resources, where the more of it you extract the less you have left, with knowledge the more we gather the more there is to be gained. We were very pleased when last year our Grenada office published their first edition; and, there are many more territories in the works. As always, the team at Terra Caribbean decided to push the envelope and to “change it up.” We believe that often standing still means the world goes past you, so we like to move quickly to stay ahead and help you our clients to also stay ahead of the trends. Internally we called this 11th edition “The Red Book version 2.0”. The aim is the same - to provide a reference guide on the Barbados market for our clients and the wider industry within the segments of the market that we operate. We try to suggest some possible conclusions from the data but we certainly do not mean to offer specific advice from this high level publication. Our Advisory, Brokerage and Facility Management teams offer advice every day within the scope of their respective practice areas. We provide that advice to a wide spectrum of clients - from some of the largest conglomerates in the region to individuals contemplating their very first real estate transaction. We believe that an informed market place makes better decisions. We participate in that market place and we have a passion for knowledge. The Red Book is a reflection of that passion and we hope that you will find our latest edition to be even more useful in your decision-making process regarding real estate investment. As always I am very appreciative of the whole team for putting this together. The online version can be found on our website, so please feel free to share it as much as you like. Also remember to drop me a line with any idea that you have for a future edition and how we could be of help. Please enjoy reading the articles or just looking at the property data. Most of all, I hope that when you have looked at it you will conclude that you are more informed about the market. The Red Book is often quoted by individuals and has even been referenced by the International Monetary Fund. I am not sure how we feel about that but I guess they thought it was useful. I hope you will too. Terra Caribbean is not the estate agent for all the developments and properties depicted and in some cases has compiled the information contained in this section, and other sections, from public sources. Consequently, details provided herein may not be accurate or may have changed without notice to Terra Caribbean since, and in some cases, prior to the publication of this book. None of the details contained herein are to be relied upon as a representation of fact and any intending purchaser or tenant must satisfy himself by enquiry, inspection or otherwise as to the correctness of the details given for each development or property. Terra Caribbean does not make or give any representation or warranty whatsoever in relation to any development or property shown and in particular does not warrant the correctness, completeness or quality of the information provided. In no event will Terra Caribbean accept liability for any injury, loss or damage whatsoever, including, without limitation, indirect or consequential loss or damage, arising from the use of or reliance on information provided in this publication. ÂŠ 2018 Terra Caribbean. All rights reserved. Let’s Take A Caribbean View It has been an unusual last few seasons for Barbados and indeed an unusual last few seasons for the wider Caribbean. The world is changing, economies evolve and develop and Barbados has seen a big adjustment. Islands and the French West Indies in particular were severely affected and are, to a varying degree, still in recovery mode. It is worth being aware that 70% of the Caribbean was untouched by the storms and for the likes of southern lying Caribbean islands like Barbados they are positioned outside of the ‘hurricane belt’, so much less prone to extreme weather. The Knight Frank team has recently published our Caribbean Inside View publication, and it was reported that: The performance of the Caribbean’s prime residential market varies significantly from island to island. In recent years momentum has been firmly focused on the island of Mustique, the Bahamas (in particular New Providence and Paradise Island) and prior to Hurricane Irma, St Barts. These islands have all recorded strong sales activity, the only constraining factor being their lack of inventory. Elsewhere, the BVI and Barbados have experienced weaker market sentiment. 70% OF THE CARIBBEAN WAS UNAFFECTED BY HURRICANE IRMA. The headline for this season, is that for anyone who has been considering buying on the island, Barbados is the most affordable it has been for probably 10 years. that for anyone who has been considering buying on the island, Barbados is the most affordable it has been for probably 10 years. When advising any of my clients on buying a home in the Caribbean we usually start with what their dreams and aspirations are and then travel through the region discussing the islands, the types of properties available and the lifestyle benefits. With friendly locals, one of the best all year around climates (closer to the equator and further south than most), restaurants, shops, bars, wildlife, history, cricket, polo, golf, horse racing, houses, apartments, sea view, golf view, polo view - this is why I always describe Barbados as the ‘Swiss army knife’ of Caribbean islands. In all of the Caribbean, there is a bit of a generational ‘changing of the guard’ taking place. With many long term owners now selling they are being replaced by a new generation. Albeit a new generation that still wants what Barbados has always been famous for, but also thinking about Barbados needing to be attractive for their children and any younger family or friends. The island has seen this need most strongly in recent years, and thankfully is adapting and you can see it in the type of investment now coming to the island. A gap in the market is now being filled for a more active and fun beach scene for a slightly younger generation often the children of current owners. New beach bars and restaurants have opened, and in particular, the big brand of Nikki Beach has been a roaring success, bringing a much more glamorous and fun feel to the island that you might find in Ibiza, or St Tropez and closer to home, in St. Barts. The return of the US buyer Following a lull in 2016, US enquiries have strengthened in 2017. Rising consumer confidence, firm economic fundamentals and easy connections from the East Coast explain the strengthening demand. Mustique sees sales and rentals strengthen Home to only 100 villas and with the Cotton House Hotel at its heart, the island has witnessed strong sales activity in 2017 with a property sold at around US$35m, being the highest price for several years. The Florida Building Code (FBC) a set of standards used as a benchmark in hurricane -exposed areas, is being widely implemented across the region. In the short-term expect greater focus on less-exposed islands. Stronger opportunities for investment and trade co-operation have been formed between Chinese companies and the Bahamas which in turn is leading to rising interest from Chinese HNWIs. Post-Brexit - a new safe haven? There is potential for northern European and UK buyers seeking a second home in a warm climate to look more closely at the Caribbean as a safe-haven destination post April 2019. New direct flight routes from Europe are making the Caribbean more accessible but future currency shifts are likely to influence the scale of interest. Set in over an acre of mature tropical gardens, this impressive property has recently been expanded and beautifully furnished throughout. The beloved holiday mansion of Sir Cliff Richard, this is a rare gem within the upscale gated community at the Sugar Hill Resort. Sandy Lane, St. James Aurora is a beautiful Larry Warren-designed residence occupying a great position within the Sandy Lane Estate on High Ridge Road. • This home has 7 bedrooms, 8 bathrooms and 1 powder room. Located east of the world-famous Sandy Lane Estate, this is a truly unique private estate highlighted with an original Oliver Messel home. Make Barbados Home After an encounter with Barbados’ gorgeous beaches, perfect weather and friendly warmth, owning a home - or even a second home - on the island becomes a necessity. What is required? Special Entry and Reside Permits (SERP) are available for prospective homeowners that reside outside of the island. These permits are valid for five years and incur fees according to the category for which they qualify. ELIGIBILITY: Applicants must be Non-nationals who are either: • High Net Worth Individuals: Owning assets of US$5 million or more, OR • Owner of property (not subject or mortgage) or investments in Barbados valued at US$2 million or more with funds originating outside of Barbados. Designed on one level, this is the ultimate five-bedroom home in the Sandy Lane Estate. The modern styling of the beautiful interiors welcomes you inside. Located on an amazing cliff-side, this beautiful property features unrivalled sea views and there is private access to a white sandy bay below. Turtleback Ridge, St. James Located within the prestigious grounds of Turtleback Ridge, this impressive property has been kept to the highest standards of luxury. 5 Palm Ridge, Royal Westmoreland, St. James Tucked away within the prestigious Royal Westmoreland golf estate on a unique double plot of land is Tradewinds, an exquisite home that exudes luxury. Located within the exclusive tennis community at Sugar Hill, Muscovado provides the perfect space to create priceless family memories. Carlton View Estate, St. James Enjoying a prime ridge-front position overlooking the prestigious West Coast of Barbados, this single-storey home is fully enclosed and highly private. Being Agile in a Disruptive Market “The pessimist complains about the wind; the optimist expects it to change; the realist adjusts the sails.” William Arthur Ward Adjusting the sails and riding the winds is a fitting analogy for the Holiday Rentals industry in Barbados and globally. No longer can we sit by and expect that our traditional guest will decide to return to Barbados year after year (even though our repeat rate is surprisingly high); or that the channels we always referred to for business will be the ones that year after year deliver loyal and pleasant guests. The world has changed, and with it so have the ways in which people travel, plan holidays and seek information on unique experiences. This is most evident on the higher end of our collection: agents and referral rates are far higher than independent guest enquiries via distribution channels. Looking deeper at our key source markets (UK, USA, and Canada) our Flagship and Luxury guests have increased by an average of 127% between 2015 to the end of 2017 - a direct result of strong repeat clients, and trusted long standing relationships with some of the world’s leading wholesalers and travel agents. As an interesting paradigm shift, we see quite a different reason for growth in our Classic and Essential portfolio. These portfolios have also enjoyed growth in the same source markets - 135% over the same two-year period. However, these are derived more consistently via DIY channels, the likes of Airbnb, Expedia and Homeaway / VRBO. And let’s be honest! No longer do people travel to simply relax on a white sandy beach… that is a big part of what they desire, but they also want unique destinations with the ability to experience the things they don’t have at home. From great food, including street delicacies and 5-star cuisine, to adrenaline pumping activities and fulfilling a lifelong dream - be it competing in a triathlon or ocean swim - our visitors to Barbados have grown to expect more from their vacations. And more we must deliver. The villa experience opens a plethora of options for guests, customizable and fitting for each and every member of the group. In-villa staff provide the unique opportunity to interact with local experts: learn to cook our Bajan favourites, for a private beach picnic, let the villa’s boatman teach you to snorkel, or simply swim with the turtles. Each guest’s stay is a personal adventure, crafted by a team of experts who truly understand what it takes to make a vacation memorable. That all said, it all starts with finding the perfect holiday home, and as experts in this area we stay abreast of all the changing channels and trends. This ensures our portfolio enjoys the desired exposure to new guests, all the while keeping and developing relationships with past guests to encourage their return. Having been in the industry for over 40-years you can imagine the long, trusted relationships with repeat guests and traditional agents who know the island well and themselves refer visitors. As the travel business changes, with more and more online channels it’s encouraging to see the amount of visitors who still rely on a personal recommendation, stories of a wonderful experience and a 'real person' to guide them to our expert team on island. Recognizing the homes that perform best on each of the distribution networks; yielding the rates and seasonal promotions to attract bookings; and looking for opportunities to increase occupancy to achieve owner’s objectives - all takes careful analysis and a flexible yet consistent approach. Our team must continue to change strategically and grow with the changing marketplace. Embracing the new platforms while strengthening our ties with the traditional operators, to ensure our homes attract the right guests within every segment. Accommodating the Villa Needs of the Uber Wealthy Traveller “The very rich,” as F. Scott Fitzgerald so eloquently said, “are different from you and me;” nowhere is this more apparent than in the experience demanded by today’s ultra-ultra high net worth traveller. These are the types of travellers for which Barbadian doors were opened a little bit wider during the unfortunate natural events of the latter part of 2017, which resulted in the Caribbean markets of Anguilla, St. Maarten and St. Barts being virtually inaccessible. For the luxury traveller, every detail and bespoke desire must be attended to. Continuous attention to health, wellness and entertainment are critical and demand around-the-clock attention. The mega wealthy may require a chef and kitchen assistants, drivers to shuttle them, a butler to mix a cold cocktail, housekeepers and gardeners for the daily maintenance and upkeep of the sprawling home and grounds, laundresses to ensure that clothes are always clean and ironed, security staff to guarantee privacy and safety and a 24-hour concierge and property manager. Barbados boasts an extended track record of catering to the wealthy and uber wealthy, so we welcomed the additional travellers who were new to Barbados’ shores. With new customers came new requests; suffice to say, it was an interesting insight into the variations in preferences of those accustomed to, for example, a St. Barts Holiday. Despite the differences in requests, expectations remain the same. What is common for all markets is that luxury holidays are about service. Our Flagship properties represent the crème de la crème of luxury vacation rental, each one offering that extra cut above typical luxury quality; stunning beauty, exceptional furnishings and, of course, dedicated service. Blue Sky Luxury’s shortlist of flagship properties are the most impressive luxury villas available on the local market. These homes (and their rates) are what the term ‘wow-factor’ was invented for. It is an industry fact that mega wealthy travellers usually demand large homes and multi-bedroom villas that facilitate vacations with friends and family (according to Resonance Consulting, 45 percent of the top one percent are planning vacations with friends, 41 percent with kids and 30 percent multi-generational vacations). Flagship villas are sizeable estates with a minimum of five bedrooms and more commonly, more than seven bedrooms to accommodate large groups. We curate our portfolio into the following 4 categories, with Flagship aimed at satisfying the uber wealthy traveller. This degree of client service and satisfaction requires extensive staffing. Ultimately, and as shown in the comparison chart below, this comes at a premium price - for both the villa’s owner and its guests. West Coast Condos Did you know? The West Coast beachfront condo segment started with the development of Reeds House in 1998. This development comprised 14 condos spread over 3 floors with prices ranging from US$470,000 for a 1 bedroom unit to US$840,000 for a 2,000 sq. ft. 2 bedroom unit. Port St. Charles followed this in the same year, marking the first of the major developments with over 150 units ranging from 875 sq. ft. to 3,000 sq. ft. Presale prices started at US$345,000. Old Trees followed this in 1999, with 15 units at an average of 3,000 sq. ft.
Terra Caribbean Barbados Beachfront Condo Index - West Coast A revision in the index for 2016 is seen here as additional sales completed for Q4 2016 are now included. With 2016 representing the lowest volume we have seen on the west in our indexed period, 2017 has seen a 280% increase in sales volume with 19 sales which is in line with average sales for the indexed period. Although there has been no new construction of beachfront condos the final release of completed Port Ferdinand units and the refurbishment of The St James has resulted in a 9.5% increase in the number of units available. This market has seen 27% reduction in average prices and an 8-point downward movement in the index. The year 2000 saw the launch of Mistle Cove, which offered 14 units of about 1,600 sq. ft. with an average price of US$265,000. Some years later, Maresol Beach Condominiums were launched in 1997. Offering 10 units of 700 sq. ft. at an average price of US$115,000. This Mistle Cove complex features 14 contemporary residences on a secluded beach. Terra Caribbean Barbados Beachfront Condo Index - South Coast The BCPI for the South Coast 140 beachfront condominiums in 2017 indicates a small percentage change 120 from the 2016 results. With the record setting development Capri selling out 100 its initial offering, luxury units of that standard are in short supply. This is likely to remain the case until the 80 launch of ownership option upon the completion of the Hyatt. A notable 60 re-addition to the market is the Ocean Reef development which has had a 40 good uptake after re-entering the market with adjusted pricing. However, as mentioned last year, there appears 20 to be a pent-up demand in this market and the Sandâ&#x20AC;&#x2122;s pricing strategy 0 continues to render positive results. Price in the New Market How much longer can we continue to be romantic about the glory days of 2008? Property values have changed substantially since then, however property â&#x20AC;&#x2DC;pricesâ&#x20AC;&#x2122; have not necessarily followed suit. The transaction volume numbers are in for 2017 (see Figure 1) and by and large it seems the market has flattened out since 2015 and is down just 0.1% from 2016. The footnote here is this still translates to the lowest sales volume on record in the last 25 years. With the considerable amount of inventory on the market, perhaps itâ&#x20AC;&#x2122;s time for vendors to join together in universal acceptance that the old market is gone and the new market is here to stay - at least for the foreseeable future. There is certainly one group of market participants that is very much aware of the new market, and that is the buyers. the highest on record (contrasted by real estate sales volume being the lowest on record*). The chart below illustrates the annual percentage change for real estate sales volume and tourism arrivals from a baseline in 2008. With volume flat, and most of the market still in oversupply, the ‘elephant’ in the market continues to be price. A substantial segment of the market has grudgingly re-priced and generally that is where the market is moving. The repricing effort has been driven in part by lending institutions marketing and selling distressed properties at scale. Repricing is taking place at all levels of the market, from modest single-family dwellings in the country to luxury beachfront villas (there is one which had a US$15M reduction and is still looking for a buyer). Those vendors that continue their romance with the old market (and there are many) are finding their properties sitting for protracted exposure periods. Buying Property in Barbados Below is a guide to buying, selling and owning property in Barbados. There are no restrictions on the purchase of property in Barbados by persons who are non-nationals or permanent residents. There are no capital gains or inheritance taxes in Barbados. period being of this size. The average rental price for 3 bed properties was US$3,970. The bulk of rentals in this period were priced in the $2.5K - $5K price range with 76% of the data set in this range. Christ Church and St. James continue to be the most popular locations in the data set with 53% and 36% respectively, accounting for nearly 90% of the total. Apartments are the most commonly rented property type, with 47% of the sample. The convenience of this type of property, combined with the access to amenities offered, makes for an attractive proposition. The real cost of home ownership? Buying a property is a big investment. And as a first-time home buyer, you have much to consider: getting pre-approved for a bank loan, deciding what type of property fits your lifestyle, figuring out where you want to live, finding a qualified agent, and then navigating all the steps from the initial offer to the closing. Crunching the numbers - the cost of buying a home So the bank tells you that you are preapproved for a home loan with a purchase price of $300,000. Upon a second visit to a home, you are sold; it just feels right. It’s listed at $325,000, but with a great agent by your side, you’ve been able to negotiate the price down to match your budget. It’s a done deal - offer accepted! Congratulations, you’ve begun the process of buying a home at $300,000. So now, what will it really cost you? Along with your 10% deposit, you will also need to have an additional $11,286. Refer to chart for breakdown. 3 key strategies that save you time and money On top of those costs, there are other factors that could impact the bottom line. Below are three key strategies that every first-time buyer should consider when they are looking at property. 1. Know what’s below - Before buying land, it’s wise to find out what’s under the ground. That’s because the last thing you want to hit as you dig for your home’s foundation is rock 10-feet under. To avoid this, consider having test holes done as a condition of the sale. The cost of this is site specific and some providers offer free site visits to give you a quotation. 2. Get an inspection - Making your offer subject to an inspection is critical, especially if you’re considering an older home. When you hire a house inspector or structural engineer, they’ll do a full assessment of the property, checking the condition of items such as electrical, roofing, flooring, septic systems, and pointing out any possible structural issues. 3. Define the lines - Remember, your agent is not a land surveyor. If you are interested in accurately defining a property’s boundary marks, consider asking your agent if the owner would consider showing the line marks before the deposit is paid as this is usually done before closing. Getting your foot in the door, one step at a time Buying a home for the first time can seem overwhelming. That’s why it’s important to work with an agent who can guide you through every step of buying a home. This should include giving you these little extra nuggets of information that not only help you find the perfect home, but also ensure you make a wise long-term investment. Land Tax and the Law of Gravity The effect of the global recession on the local market has been significant, characterised by substantial reductions in transaction volume and demonstrably longer exposure periods across all property segments. Continued economic challenges have prolonged the sluggish conditions such that we are seeing an increasing supply of distressed residential properties, primarily in the low and middleincome segments of the market, where financial institutions are implementing measures to recover on their lending. This situation has been further compounded by an over supply of residential land, which despite prices declining since 2014 (as discussed and demonstrated in the Terra Land Price Index shown on page 98), appears to demonstrate a decline in appetite for real estate. and for built properties the Officers will conduct a full inspection, including measuring and photographing the property (residential), inspecting or using the income approach to value (commercial), and again reviewing comparable sales transactions. On completion of their analysis, the Officer either reduces the site/property value and therefore the property tax is assessed (resulting in a refund to the taxpayer), or the objection is overruled. Interestingly, the revaluation process utilises a “mass appraisal” approach to assess trends in large volumes of data, which while a widely accepted tool for the valuation of property for taxation purposes, differs from techniques used by Valuers focusing on individual properties. Terra Caribbean Barbados Land Price Index This year is the third time we have published the Terra Caribbean Land Price Index (TCLPI) and with each iteration, we refine the process for information gathered and add to the volume of information in the analysis set. We continue to operate in a market with imperfection information, and as such, this data that we curate and maintain grows in value with each successive year. It is a live data set with additions constantly being made to the most recent periods as well as to historic periods as new information becomes available. normal total data view. The volume leader is Christ Church, which is not surprising, with several developers offering residential developments in the parish (e.g. The Grove), due to its excellent location for professionals working on the south. St. James commands the highest median price in this subset of the data, which as we noted last year is partially attributed to the nature of many of the sales in the parish being in niche developments. Characterized by expansive living spaces and extremely sophisticated architectural design and specifications. The finishing and materials are of the highest quality. Prestigious location. *These are average prices and may vary according to contractor chosen. These prices do no include VAT. Special Development Areas Act The Special Development Areas Act sets out the designation of special development areas and provides relief for approved developers constructing or improving a building or structure in those areas and to persons financing such work (other than a commercial bank). An approved developer pays Corporate Income Tax (CIT) at the rate of 15% Is granted initial allowances of 40% and annual allowances of 6% on industrial buildings Is granted initial allowances of 20% and annual allowances of 4% on commercial buildings. Hotels including conference areas; Residential complexes; Commercial or industrial buildings including office complexes; Other tourism facilities; Water-based activities; Tourism projects highlighting heritage and natural environment; Arts and cultural investments; and Agricultural-based activities. Carlisle Bay Redevelopment area in St. Michael; Speightstown in St. Peter; St. Lawrence Gap in Christ Church; and The Scotland District Conservation Area. Income tax on interest earned on loans to approved developer. Four bedroom villas were the most common size in the survey with 27%, followed closely by three bedrooms with 25%. These two combined represent over 50% of the stock available. Note the houses included in the survey results represent over 1,100 â&#x20AC;&#x153;roomsâ&#x20AC;? if viewed as more traditional accommodation. As would be expected, pricing generally correlates with size, the chart below shows the median Summer and Winter rates for properties within the survey. Rates for properties of more than nine bedrooms are not shown on the Median Price Chart but are represented in the Winter vs Summer Rates Table. Tourism continues to be a key driver in all aspects of Barbadosâ&#x20AC;&#x2122; economy and has formed a principle component in our Red Book content. This year we present a collection of useful reference statistics about the industry, including total stay over arrivals, a deeper dive into some key markets and a more nuanced look at the arrival numbers. Stay over arrivals set another record last year with 663,511 total stay over visitors. This also included nine months with individual best arrival numbers. Since the most recent low in 2013, arrivals have recovered by 30%, however last year saw a 5% year on year growth, which is a slowdown from 2015 and 2016 growth rates. Our three largest individual source markets continue to be the UK, USA, and Canada, but looking closer at them, we note that while growth trends remain strong for North America, the UK has plateaued with 2017 representing a slight decline over 2016. STAY OVER ARRIVALS SET ANOTHER RECORD LAST YEAR WITH 663,511 TOTAL STAY OVER VISITORS. THIS ALSO INCLUDED NINE MONTHS WITH INDIVIDUAL BEST ARRIVAL NUMBERS. Purpose of Visit As would be expected, the overwhelming majority of our visitors are accounted for by those visiting for pleasure. In the last three years these visitors made up 75% of the stay over arrivals. The chart below gives a break down of the numbers for the last three years, a notable category is that of crew, which since explicit tracking started in 2015 has seen nearly 30k arrivals a year, nearly 5% of our total arrivals annually. and cultural heritage and for the construction of properties in non-coastal areas. For detailed description of exemptions and allowances please see the CAP 341 - Tourism Development Act. Commercial Rental Market The A-Class office market continues to grow at a measured pace. The majority of the new supply constructed in recent years is centred within the Warrens and Welches area. With supply and demand generally at equilibrium, Developers will generally require a minimum commitment prior to commencement of construction of new properties. The calibre of buildings continues to improve with a strong focus on energy efficiency and sustainable components in the design and construction of new properties. With one new A-Class office building due to be completed in 2018, it is unlikely we will see any notable increase in supply in the next 12-24 months. RENTAL RATES: In our table below prime properties are located in commercial centres with easy public transport accessibility, built with quality design externally and internally, which are energy efficient, and have tenants that are financially strong. Absence of any of these criteria means that an asset will generally be shown here as “other” property. Bridgetown Other $20 - $25 • At the start of 2008 there was 565,000 sq. ft. of A-Class office space in Barbados. • In 2011, approximately 209,000 sq. ft. of space was added to supply as a result of 2 building completions in the Warrens area. • In 2018, of the approximately 1.3 million sq. ft. of A-Class office space, 40% is located in the Warrens/Welches area. • The most recent addition is 50,000 sq. ft. of A-Class office space at Warrens, of which the majority would be occupied by a single entity. • Of note is the growth in owner-occupied A-class spaces as corporations seek to house staff in higher standard buildings, resulting in few vacancies of A-Class office space. • Increase in B-Class and higher vacancies as premium customers and Government entities acquire and occupy their own A-class spaces. • The Collymore Rock area has the second highest amount of A-Class office space with over 218,000 sq. ft. in 4 office buildings. NB: These rates are base rates and do not include VAT or CAM. How Does your CAM Stack Up? Common area maintenance (CAM) fees, also referred to as ‘service charge’ in some commercial leases, refer to the costs associated with operating and maintaining the space shared by the tenants within a facility, and is charged in addition to the base rent. The CAM Fee In its simplest form the fee is calculated as the sum of the CAM components ($) divided by the total net leasable space (ft2). Typically, the commercial landscape in Barbados utilises triple net leases (should refer to A-Class) which require the tenant to pay the net amount for three types of costs: property taxes on the leased asset, building insurance and all maintenance in addition to any other agreed fees. Therefore, the CAM fee would include the items in the below chart. Repairs & Maintenance Services Refers to costs associated with maintenance services such as pest control, landscaping, garbage removal and saniwaste as well as salaries for any on-site maintenance personnel. It also includes the costs for décor, advertising and marketing in the case of Shopping Malls. Costs associated with security monitoring and response services as well as manned security services. Figure 1 below shows the approximate proportion of each CAM component for a typical A-Class commercial office building and a retail property. Most organizations, if not all, strive to increase revenue by reducing overhead costs. However, one must be cautious that quality is not sacrificed in an effort to trim costs. Value for money should therefore be at the forefront of cost cutting exercises. Here we explore ways in which the top CAM contributors can be controlled and, in some cases, reduced. Property Tax • The only possible way to reduce this component would be to file an objection to have a review of the Land Tax assessment, however, there is no guarantee that it will change, and there is the possibility that it may increase as a result of the re-assessment CAMs are generally composed of nine (9) components as shown in the above chart. The composition of these components may differ across properties due to facility features and functions which some properties may possess that others don’t, and as a result, the top CAM contributors may vary as well. The New Way to Work Workspace is changing. Now more than ever, the demand for flexible and shared office space is on the rise. As of 2017, there were more than 14,000 co-working offices worldwide with 1.2 million people having secured shared office space at some point (2017 Global Co-working Survey). The industry is full of success stories and valuations worth millions and billions of dollars; WeWork recently hit a $20 billion valuation and Regus, the world’s largest provider of flexible workplaces, now operates more than 2,300 business centres in over 106 countries, including Barbados where it boasts a 90% occupancy rate. Crunching the numbers: Traditional Leasing vs. Co-working A-Class office space in a prime location in Barbados comes at a premium which may be out of a typical tenant’s price range, especially in the case of a small business or an early-stage bootstrapped start-up. Regus’ opening in Barbados signalled the arrival of the modern co-working space, however the concept started here back in the 1990s with The Corporate Centre on Bay Street offering serviced offices. One of the greatest drivers of this trend is the entry of millennials in the workforce. The 9 to 5 static and archaic work culture is being dismantled and the rigidity of traditional office structures is becoming a thing of the past. Corporate hierarchies and social norms in business interactions are being redefined and opportunities for collaborative work, individual expression and a greater work-life balance are being embraced - including greater mobility and virtual connectivity. Real Estate Throughout the Region Our regional reach Our real estate knowledge goes a long way. Headquartered in Barbados, with offices in Trinidad, Grenada and St. Lucia and strategic alliances in other islands, our work extends to many islands in the Caribbean. Our reach, depth of expertise and wide-ranging services offer clients a broader perspective on all Caribbean real estate matters. We leverage our experience and actively accumulate, bank and share knowledge with our clients to ensure they feel comfortable and confident to make informed decisions about real estate in the region. OFFICE LOCATIONS AFFILIATE OFFICES ADDITIONAL KEY MARKETS SERVED Our firm also has established relationships with key brokers throughout the Caribbean. Our exclusive partnership with Knight Frank provides unrivalled access to global markets. An Inside View of Luxury Caribbean Five Bedroom Villas The villa market in the Caribbean varies in price and standards throughout the region, with traditional markets like Barbados and St. Barts seeing increased competition from up and coming markets like St. Lucia, Antigua and Grenada. One area where the established markets have a proven track record is at the ultra-high end, with the availability of trophy or flagship properties. It is clear from these properties that the established markets with their proven track records and demonstrated ability to support the high-end clientsâ&#x20AC;&#x2122; needs attract a significant premium on the newer markets. As the markets grow to provide this support with things like world class dining and entertainment they will present much more viable alternatives joining other niche locations like Jumby Bay in Antigua and Mustique which have proven unique appeal. In order to gain a better understanding of the dynamics at this end of the market we have selected a range of five bedroom trophy properties across the region to compare. Name: Villa Tamarindo Location: Beachfront, St. James Beachfront property in Barbados went though a period where developers looked to maximize use by building condominiums on beachfront land. Villa Tamarindo is part of a return to flagship villa development in these spaces. Designed by renowned architect Larry Warren it incorporates very modern styling with traditional Caribbean elements and really sets the tone for the other properties earmarked for the surrounding lots. Name: Petite Saline Villa Location: Petite Saline Hillside property in St. Barts offers spectacular views and this property overlooking the bay of Lorient and spanning across more than 3 acres with an open plan layout opening out to an infinity pool surely delivers just that. In addition to the main pool, the master bedroom has an attached private plunge pool. The property also features a tennis court. One of several homes planned in a development connected with the Laluna boutique hotel the Italian designed villas offer contemporary modern designs with a Balinese influence. Access to the amenities at the resort is included with ownership including tennis courts, gym and spa. Luxury developments in Antigua are currently clustered in several enclaves around the island, this property is in one of them overlooking picturesque Galley Bay. Easy access to amenities such as restaurants and high-end shopping is not as common as in well established markets. The house is finished with vaulted ceilings and hardwood floors and tastefully furnished with Italian furniture. Price: USD$8.5 Million Name: Arc en Ciel Location: Beau Estate, Soufriere With building on the beachfront in St. Lucia effected by the Queens Chain edict it is no surprise we find this property nestled in-between the Pitons and bordered by a forest reserve. This property incorporates many features of traditional Caribbean architecture with verandahs, jalousie shutters and wooden railings. Donâ&#x20AC;&#x2122;t let the traditional exterior fool you, however, as the house features all modern amenities you would expect of a property of this caliber. first real estate boom in Barbados is highlighted having been brought on by the production of “sweet gold” in the form of sugar. The land that produced that sugar and created significant wealth for many generations still exists, but in relative terms it is worth much less today than commercial, residential, tourism, or beachfront land. In the late 1950’s a plantation owner told my father that the land at Sandy Lane was worthless as the soil was sandy and infested with crabs! So, what drives the value of land in Barbados as compared to our neighbors in Trinidad, Grenada and St. Lucia? In order to answer this question we have looked at what we think are the top 5 drivers of value today in various markets across the region. We must make the point that we are referring to the current market, as this too can change, just like the price of sugar changed the value for the plantation lands that produced the sugar cane. The tables below depict the top 5 drivers. WHEN OUR MAIN SOURCE MARKETS OF BRITAIN, USA, CANADA AND EUROPE SNEEZE WE GET A COLD. Our prediction for Barbados Property values for foreign investors will improve over the next 5 years while property values in the local market will remain stagnant. The vacation home market will improve as a result of the stronger world economy but the local market that is driven by internal demand is predicted to remain flat for the next 3 to 5 years until confidence can be regained and Government debt is reduced to a manageable level. Our prediction for Trinidad The Trinidad economy is one of the largest in the Caribbean. A recovery in the world prices for petro-chemical products has both an immediate effect on Government revenues as well as the long-term effect of renewed investment in the sector. We expect that the local real estate market will recover slowly over the next 18 months to 2 years. Our prediction for St. Lucia There will be an expansion in the vacation home market and positive returns across the local real estate market as well over the next 2 to 5 years. We are seeing more demand for St. Lucia as a result of the growing tourism base and offshore sectors. AND WHEN THEY GET A COLD WE GET DOUBLE PNEUMONIA! running CIP, having first launched in 1993. St. Lucia is the most recent to embrace CIP (2016). The Government Donation options vary across territories. Real Estate investment requirements are usually higher and are tied to government-approved projects. Additional costs include: Due Diligence fees, Processing and Application Fees, Government Fees, Passport Fees and Certificate of Naturalisation. CIP comparison tables show a top line comparison of fees and general benefits across the 5 participating Caribbean countries. Provides for the imposition of a tax on land and for related purposes. Amends the Land Tax act to make provisions for the land tax measure set out in the Financial Statement and Budgetary Proposals for 2011. Includes cap on residential property tax, and rebates for hotels, pensioners, villa operators, individual manufacturers,. Provides for the imposition of a tax on the disposal of land and company shares and for related matters. Makes provision for the registration of titles to land and for dealings in land so registered, for the administration of the unregistered system of dealing in titles at the Land Registry, and for purposes connected therewith. Makes provision for determining the valuation of land for taxation, rating and other purposes and for matters connected therewith or incidental thereto. An Act to authorise the acquisition of land for public purposes. Makes provisions respecting the adjudication of titles to land. Represents the demarcation of land boundaries and related matters. Makes provision respecting the purchase of agricultural holdings by tenants and for the purpose of facilitating agricultural development in Barbados. Provides for the designation of special development areas and for relief to persons carrying out work in those areas and to persons providing the financing of such work. The boundaries of the areas specified in the First Schedule to the Special Development Areas Act are prescribed in this Order. Facilitates the division of properties into parts that are to be owned individually and parts that are to be owned in common and to provide for the use and management of such properties. Consolidates and amends the Acts of Barbados relating to landlord and tenant. Provides for the registration of premises that are let out and related matters. Reforms the law relating to the method of obtaining title to land through the procedure known as "a title suit" or "a foreclosure suit". Encourages the sustainable development of the tourism industry by providing duty-free concessions and income tax concessions for approved tourism projects and certain tourism entities and for other related matters. Amends the Tourism Development Act of August 31, 2002. Encourages the sustainable development of the tourism industry by providing duty-free concessions and income tax concessions for approved tourism projects and certain tourism entities and for other related matters. Revises the Barbados Tourism Authority Act. [1st November, 1995] This Act establishes the Barbados Tourism Authority as a body corporate and provides for its functions and powers, organization and management. The Act also establishes the Board of Directors of the Authority and the Tourism Advisory Council and provides for the licensing and registration of tourist accommodations by the Authority. Barbados Tourism Product Authority Act, 2014. Promotes and facilitates the efficient development of tourism in Barbados, the repeal of the Barbados Tourism Act CAP 342 and for related matters. Provides for the prevention and control of money laundering, the prevention of the financing of terrorism and for related matters. Reforms the law in respect of the prevention and control of money laundering and financing of terrorism and provide for related matters. The Guideline, which is being issued in conjunction with the Anti-Money Laundering Authority pursuant to its powers under Section 26 of MLFTA, replaces the 2006 KYC Guideline and is updated to reflect the changes in the MLFTA. Makes provision for the registration of persons exercising or engaging in any profession, trade, business or calling and to provide for related matters. An Act to vest in the Crown certain lands, to make provision for the acquisition and disposal of lands by the Crown, for the lease of certain land by the Crown and in relation to land acquired by the Admiralty for the Oceanographic Research Station, and for purposes connected therewith. Provides a right for tenants of lots in certain tenantries to purchase the freehold in those lots; to alter section 16 of the Constitution to assure the constitutionality of that right; and to provide for matters related or incidental thereto. Makes provision for the orderly and progressive development of land in both urban and rural areas and to preserve and improve the amenities thereof, for the grant of permission to develop land and for other powers of control over the use of land. Amends and consolidates the law relating to succession to the property of deceased persons, and, in particular, the devolution, administration, testamentary disposition and distribution on intestacy of such property, and to provide for related matters. Establishes the Barbados Revenue Authority and to provide for its structure, management and functions, for appeals against its decisions and for related matters. This Bill would amend the Barbados Revenue Authority Act (Act 2014-1) to make provision for the issuance of tax clearance certificates and for related matters. Provides for the imposition and collection of value added tax and for related matters. Amends the Value Added Tax Act, Cap. 87 to increase the efficiency of tax administration, provides for the imposition of value added tax on certain mobile services and enhances the enforcement provisions in the Act and for related matters. Provides for the imposition and collection of the â&#x20AC;&#x153;municipal solid waste taxâ&#x20AC;? and for related matters. NOTE: This Act expired on March 31, 2015 but all outstanding taxes must be paid to obtain a tax clearance certificate when selling property.